I also decided to change up the tone control for a little more variety and to make this into something a little different. I had heard a few good words about the James Tone control a.k.a. Baxandall tone stack. This is a two knob type with a Bass and Treble control. 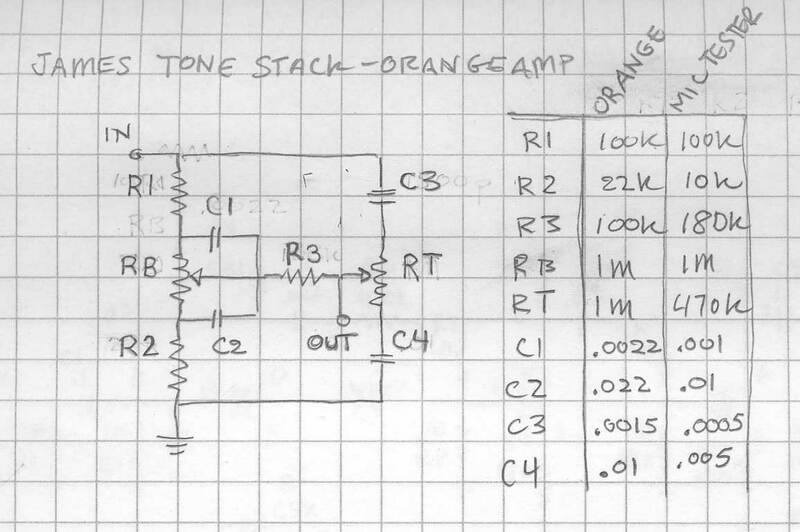 A good description of this tone stack can be found here. Here’s a shorter less technical description. Here’s an image of the James/Blaxandall tone stack. RT and RB are the Treble and Bass control. I had run into this tone control before at Freestompboxes.org in a project by forum member Mictester. It was included as part of a project called Bigmuff Plus. This was sort of a BMP on steroids. 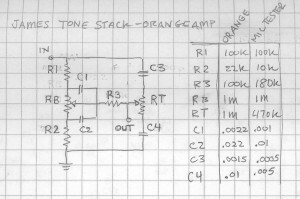 My drawing includes values for the Orange Amp tone controls and the values used in the Big Muff Plus. Note that the Blaxandall uses the Audio taper pots for the Bass and Treble controls. These are not required but, without them the usable adjust range is bunched up at one end of the pot rotation. I built everything on a breadboard to test out the idea. I tested each stage as I built it. One thing that impressed was how bad the distorted sound was without a tone stack. I shouldn’t really say “bad” as the sound wasn’t terrible. Heck, it’s distortion right, so it might sound good to somebody. What is “bad” when it comes to distortion? The sound did lack the refinement and had some extra high end hash that wasn’t helping in my opinion. Through headphone the sound was unbearable. The headphone, I’m guessing, were reproducing more high end then would come out of a guitar speaker. After adding the tone control the sound was much smoother and had a lot to recommend it. Later I added the extra low pass filter following the tone control. This really moved the sound into the Marshall territory. This kind of extra fixed filter stage added to the end made a noticeable difference in the sound. Seems like it might be a good addition to a lot of boxes. Originally I had planned on using the Orange tone stack. Turns out I could only find a single A1M pot. Looking over Mictester’s take on the Blaxandall, he used different resistor and cap values alone with a A470K pot for the treble control. I did happen to have an A500K pot (with detents, it clicks at each of sixteen steps). So I Decided to go with those values. Some times you have to just work with what’s available. I drilled a box fit all the parts and wired up the standard box connections. I drew up a perf board layout which placed all of the transistors in a row. I noticed at this point that the BS170 is DGS while the 2n7000 (another MOSFET) is SGD, seems like it would possible to swap these. I’m not the greatest at making flowery descriptions, but here goes. The sound is tight and crunchy. You can dial in a surprising amount of low end with the bass control. The bass is tight and doesn’t get muddy. It’s got a sound you would associate with Marshall amps. I’d say it does AC/DC to Van Halen. It doesn’t quite get to metal. The added low pass along with the higher impedance tone stack cut the output noticeably. The volume needs to about 3 o’clock for unity gain. Might be good to add another transistor on the end to boost the volume. Then again maybe tinkering with the volume pot might be enough. I really love these boxes. I made several of them and the Zvex Hardon. I use them in series up to 4! It is not a distortion pedal but for me a “fatten up tone shaping pedal”. For solo’s that cut through the bandmix you need a mid-rangy dist. I use the boxes in front of a Wampler Black65 clone and it give the sound very big balls! Very Fat Fenderish Sound. When you use it ifo a marshall amp or pedal I think it will sound very fat Marshally. It reacts really like a tube amp on your picking and guitar volume. The only thing I changed in the schematic was adding a 470 pF over R2 to kill the Harsh Hights. That works very good. I tested the box with a 2N7000 and the Zetex BS170. Both sounded less good to me.